FilmTouch 2.0 Pro is applied like any plugin effect in Adobe After Effects (Windows, CS5 or later, including any version of After Effects CC Creative Cloud). (NOTE: We currently have no MAC plugins for After Effects, but may soon! Click here to be notified.) Simply drag-and-drop FilmTouch 2.0 Pro onto a timeline layer, from the Pixelan folder of the Effects and Presets panel of After Effects. See below for the basic steps to using this plugin. After a few minutes of experimenting with the FilmTouch 2.0 Pro plugin, you will have much of the creative power of FilmTouch at hand for your projects. Note that all of this info is also available offline (for users who do not have Internet-connected editing stations) by clicking the FX Help button shown below. In the Effect Controls panel, all FilmTouch controls are available directly in the panel as shown above, like any After Effects plugin. But you can click the Open Pixelan UI button to access the Pixelan custom interface (as shown below). Both interfaces are similar, but the Effect Controls panel offers native keyframing of controls and is most convenient for quick tweaking of film looks. The Pixelan custom interface shows detailed help more visibly. 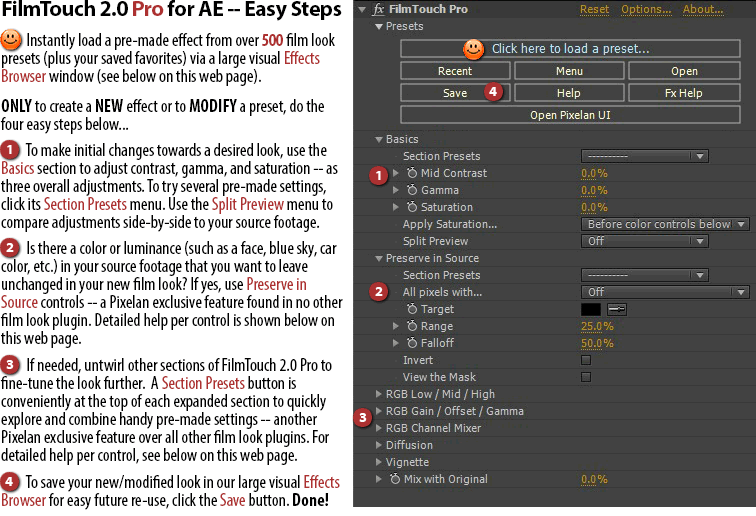 In FilmTouch 2.0 Pro there are THREE ways to access presets -- Effect Browser presets, AE Animation presets, and Section presets. This is the most powerful and visual way to access presets and is where 500+ film look effects presets are located. 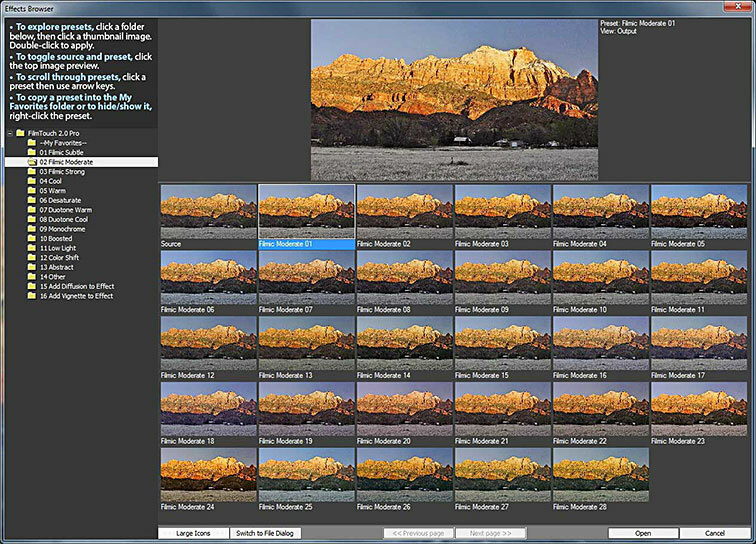 Click the Click here to load a preset... button at the top of FilmTouch 2.0 Pro (as shown by the smiley in the above image) to open a large Effects Browser window to visually choose/compare pre-made effects. The Effects Browser is shown below. To save your own custom presets in the Effects Browser, use FilmTouch controls to set up the desired look, then click the Save button. Prefer to use the Pixelan custom interface instead of After Effect's interface? Instead of the above, use these shortcuts to load presets faster: To see recently chosen Effects Browser presets, click the Recent button. For a drop-down menu of Effects Browser presets, right-click the Click here to load a preset... button. To use a standard Open file dialog box, Alt-click the Click here to load a preset... button. Unlike the Effect Browser presets, these change ONLY the controls in ONE section of FilmTouch controls. Mixing presets from several sections is a quick and easy way to try hundreds of fresh film look effects and variations. Within any section (aka "twirly") of controls, choose from the Preset menu. (In the Pixelan custom interface, click the blue FX folder icon at the top right side of any section.) To choose a section preset visually instead of from a list, in the After Effects interface click the submenu to activate it, then use your mouse's scroll wheel. In the Pixelan custom interface, simply move your mouse through the choices. If you prefer, you can save FilmTouch presets as animation presets in the usual place within After Effects, by selecting FilmTouch, then choosing Save Animation Preset from the Animation menu in After Effects or from the Effects & Presets panel menu. Mix with Original. To alter the film look effect’s overall strength, adjust its transparency with the source image. Positive values increase the source’s strength. Negative values can create unusual looks -- experiment! To fade in/out the entire film look effect, use After Effects standard keyframing for this control.